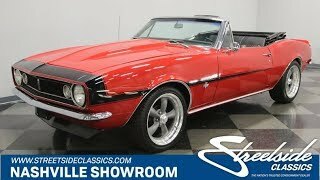 Hi, I am interested in your 1967 Chevrolet Camaro (stock #0930-NSH) listed on Autotrader for $37,995. I'd like to get more information about this vehicle and confirm its availability. This car has all the ingredients to make for some good time summer fun! Its one of the most popular classics on the planet. Its Red. And its a convertible. It just needs a driver like you to turn the key and start stirring things up. Its not only the factory correct Red for this car, its Red with some attitude. The cowl induction hood looks like its flexing its muscles. Which is appropriate, because after all, this is a muscle car. Then there is that Black mustache stripe. Its like a bumble bee stripe that went its own way down the side of the car. Top down fun is obviously the goal, but hey, sometimes the roof has to go up. The nice thing here is that the convertible roof is black too, so it fits right into the look when you are tooling around top up. There is a nice blacked out grill and a deep chin spoiler with a thin chrome bumper shining brightly in between up front. Camaro in script over crossed racing flags appears on the front fenders and the wheel wells and rocker panel are trimmed out in chrome. The rear has a full width trunk spoiler with a couple chrome exhaust tips peeking out from under another nice shiny bumper. Open the door or just look inside if the top is down and you will find a nice fresh interior. The door panels are neat and clean looking with chrome trim along the top and bottom as well as on the armrest. The seats are freshly recovered and there is new carpeting as well. There is a three spoke steering wheel with an RS horn button framing the factory gauges that are set deep into their pods and trimmed in chrome too. The dash pad is spotless and the center console contains the ventilation controls along with a JVC head unit for your listening pleasure. There are auxiliary gauges mounted just below that to keep accurate tabs on water temp, oil pressure, and voltage. The center console continues on back trimmed in black and chrome with the shifter for the automatic transmission and some nice storage in it. Taking a peek under the hood you will find a nicely detailed out engine bay with a 350 cubic inch V8 sitting down inside it. It shines as brightly as the outside of the car too starting with a chrome air topper feeding an Edelbrock 4-barrel carburetor and a highly polished Edelbrock intake. Chrome Edelbrock valve covers with a red, white and blue Camaro oil filler cap keep the show going and it all contrasts nicely with the orange ironwork of the engine. There are signs of good routine maintenance and some fresh new parts like the master cylinder and a radiator that has been upgraded to a Stant unit. The exhaust runs back through thrush style mufflers which give the car a nice sound, and power flows back through a 2-speed automatic transmission. The car sits on American Racing wheels with 255/45R18 tires mounted at the rear and 225/45R18s at the front. Come on down and check this car out. Then take it home and stir up some fun with it.